TUESDAY, Jan. 12, 2016 (HealthDay News) -- A widely used dementia drug shows potential in reducing the risk of falls among Parkinson's patients, new research suggests. 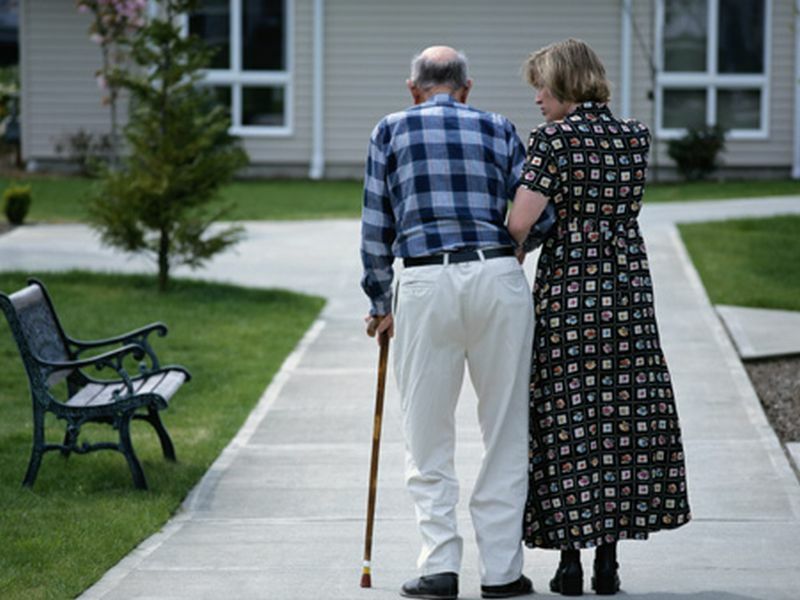 "With the degeneration of dopamine-producing nerve cells, people with Parkinson's often have issues with unsteadiness when walking. As part of the condition, they also have lower levels of acetylcholine, a chemical which helps us to concentrate -- making it extremely difficult to pay attention to walking," said study lead author Emily Henderson, from the University of Bristol in England. The study included 130 people with Parkinson's disease who had fallen in the past year. Half took the drug rivastigmine (Exelon), while the other half took a placebo. After eight months, those who took the rivastigmine capsules were much steadier when walking and 45 percent less likely to fall than those who took the placebo, according to the researchers. The study, published Jan. 12 in The Lancet Neurology, was funded by Parkinson's UK. Parkinson's disease is a chronic and progressive movement disorder marked by tremors, stiffness and loss of coordination. About 70 percent of Parkinson's patients fall at least once a year and one-third have repeated falls, increasing their risk of broken bones and hospitalization, the researchers said. "We already know that rivastigmine works to treat dementia by preventing the breakdown of acetylcholine [in Parkinson's patients], however our study shows for the first time that it can also improve regularity of walking, speed and balance. This is a real breakthrough in reducing the risk of falls for people with Parkinson's," Henderson said in a Parkinson's UK news release. One U.S. doctor added a caveat, however. Dr. Andrew Feigin, director of the Experimental Therapeutics Unit at the Feinstein Institute for Medical Research in Manhasset, N.Y., said the finding suggests "that rivastigmine may reduce falls in these patients, though the difference between the rivastigmine and placebo groups may have been driven by increases in falls in the placebo group as opposed to decreases in the rivastigmine group. "Nonetheless, if validated in a larger trial, these findings could have significant implications for the treatment of gait abnormalities and falls in advanced [Parkinson's disease] patients," Feigin added. Arthur Roach, director of research at Parkinson's UK, stressed the importance of preventing falls among Parkinson's patients. "People affected by Parkinson's, their [caregivers], and health and social care professionals have said that preventing falls and improving balance is the biggest unmet need for people living with the condition, other than finding a cure," Roach said in the news release. "Things that may be simple to us, such as walking upstairs or getting up in the middle of the night to get a glass of water or go to the toilet, are much harder and more dangerous when you could easily fall. You risk breaking bones and then needing an emergency hospital admission," he explained. "This trial shows that there may be drugs already available, being used for other purposes, that can be tested to help treat Parkinson's. This takes us a step closer to improving the quality of life and finding better treatments for people with Parkinson's," Roach said.